Oroville Dam History Images, Reveals Clues to Dam Leakage? What Should be Done? Mysteries to the clues of Oroville Dam's leakage revealed in historical dam images? Does DWR/DSOD already know that there is a leak through the dam from inspection reports, yet they are keeping this from the public? Why push the narrative of "rain falls...then grass grows" when the public should be made fully aware of a potentially serious precursory dam failure mode? What should be done to guarantee that this leak is not at an accelerated threshold risk threat if there is greater "unseen" leakage? Water breaches the spillway at Oroville Dam on Feb. 12. 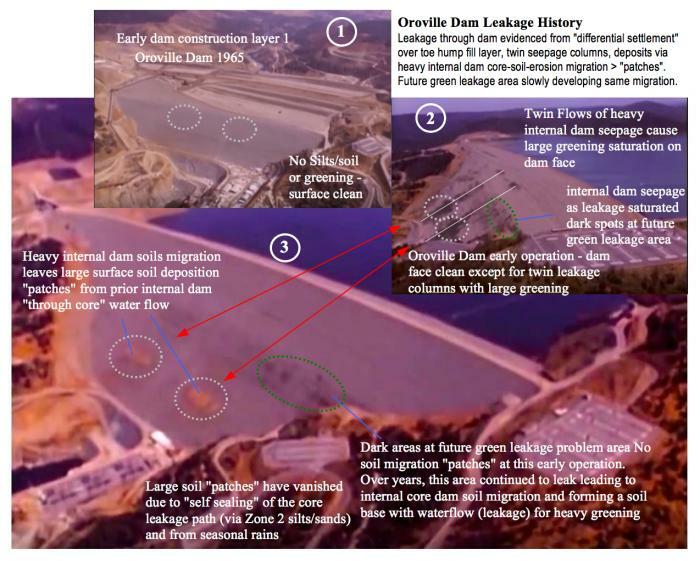 LOS ANGELES, CA (California Network) - A Historical sequence of Images at Oroville Dam infers strong evidential behavior and clues to the formation process to the persistent Leakage problem inside the dam. This internal leakage remains today and is known as the Green Wet Spot. Strong clues to the dam's behavior are revealed in an unusual original leakage behavior of the first "settlement" phases of the dam, causing "twin columns" of strong seepage. This seepage was so strong it deposited thick soil patches from internal dam material in "soils migration" (see Fig 1, image 3). The "twin columns" of this large seepage were centered aside the original 1964 construction "hump" layer. This hump layer likely had a seasonal rain densified consolidation that acted as a form of a "fulcrum" to the original settlement forces of the newly filled dam. This quickly induced differential settlement stresses to the core region resulting in core cracking and lake water flows to penetrate the internal core region and formed mirrored hillside saturation (see Fig 1, image 2). These leakage cracks resealed before 1970 as the natural "settlement" compaction of the dam "balanced out" and re-closed these flaws along with the help of silts in the upstream Transition Zone 2 materials by plugging & further sealing these flaws. At this early history operation of the dam, the beginnings of the problematic Green Wet Spot was in its infancy. It too had a "differential settlement" leakage cracking flaw, but was not as great as the "twin column" events. Note that the original dam face is revealed as "clean" with no dirt patching from construction (see Fig 1, image 1). This reveals that the "dirt patches" were depositions from the "twin column" massive saturation event & not from construction. These twin saturation zones, at the dirt patch areas, turned green in the early days (see Fig 1, image 2). These were the first Green Areas of Oroville dam. These first green areas do not exist today as the soils have been washed away and the leakage stopped. Green Wet Area - Differential Settlement? Yet, there is an area that continued to experience Greening at a "differential settlement" region of the dam . That area is along the steep slope of the left abutment. This steep slope transition is a known dam failure inducing mechanism via "differential settlement" . Thus the internal seepage and internal core cracking flaw erosion paths developed early and is continuing today. It will continue as the rock hillside will not "give" to balance out the zone 3 stresses as did the prior "twin column" flaws. Today's Dam core region leakage is transporting fine soil material within the seepage water flow. This in turn facilitates large greening growth on the dam face at the Green Wet Area. (See Fig 2). What is seen at the surface of the dam also infers that there likely is an "unseen" flow of water beneath the surface face. In fact, a large "unseen" flow deeper within the Zone 3 materials below the Green Wet spot reveals an answer that has been a mystery to California Division of Safety of Dams (DSOD) inspectors. Every time the ground is observed as saturated and wet in the Greening area, they checked and found no water flowing in these 5ft to 7ft (to combined 20ft plus wide) "erosion channels" which originate at the Greening area. Then how are these large channels forming? Micro Honeycombing deeper in the Zone 3 embankment? Using image processing and contrast resolution of satellite zoom pictures from 2011 and 2015, when overlaid, the images provide evidence that erosion channels are being formed by rainfall eroding the Zone 3 surface sands by downward percolation of these sands into a complex of small honeycombing voids below. These voids are just large enough to facilitate "sand grains" to migrate into the subsurface by rainfall. Thus, this process slowly deepens and widens the "Erosion Channels" and leaves the cobbles and boulders in place, except for the case of occasional tumbling of rock from a loss of consolidation support. What could cause these deep subsurface voiding channels? A subsurface flow of water could. Just as water reaches the Green Wet Area, a likely deeper flow under the Green Wet Area is continuing downward and has migrated the "fines" (sands) of the zone 3 material in a back-cutting intergranular erosion process where the "sands & fines" would fill down to the bottom horizontal Drain Zone spaces (See Fig 3). This horizontal section of the Drain Zone is 10 feet thick and is engineered to have spaces to allow "fines" to penetrate and flow into and through. However the Drain Zone was not intended to experience an inundation of "sands & fines" flow to the point of a clogging action. Yet, the lack of findings from DSOD inspection reports of large accumulation of sands and piles at the bottom of the dam provides evidence of this intergranular migration process and deposition of this material into void areas found in the Drain Zone. However, another dam issue problem arises in that a "micro honeycombing" process could have an adverse effect on the structural integrity of the zone 3 slope. Does DWR/DSOD already know there's a Leak in the Dam? DSOD is aware that seepage is present even in drought conditions, and when the grass is brown . DSOD inspectors even referenced the link to the reservoir as the seepage source in their report by noting the seepage rate to the lower elevation reservoir level . DSOD/DWR had this documented information in 2015, inspected in the harshest of drought stages with 81 days of no prior precipitation & hot temperatures, and they were aware that seepage still was present. Yet, in a recent town hall community meeting with the public, DWR's Christy Jones, deputy director of statewide emergency preparedness and security for DWR, stated "When the rain falls, the grass grows. There is no leak in the dam,". Given their knowledge of the DSOD documented 2015 inspection report, DWR's town hall statement to the public should be considered highly misleading. They were aware of seepage even in drought & heat conditions. Inferring the leak only to rain is misleading the public on a very serious issue and on a known dam failure mechanism (if it accelerates) . Is leakage consistent to Grass Greening? Part of the mystery of the leaking in the dam has been in measuring or observing the degree of this seepage by grass greening. Yet there are a number of factors that are misleading using this criteria as the problem may have much greater "unseen" subsurface flows. When grasses reach a "Heat stress" condition, the response by the grass to these high temperatures, is to preserve itself and become dormant (i.e. turns brown). Some grasses are more resilient to heat stress as their photosynthesis processes are different and they thrive longer before becoming dormant. One example is the notorious pesky crabgrass. The key onset of heat stress-to-dormancy transition is 90 degrees Fahrenheit. In "assessing" grass greening, one more step is required to "factor in" for the actual temperature conditions the grass may experience. That additional factor is from the sunlight thermal absorption in the Zone 3 materials. As the downstream dam face is southern, and the dam face is angled upward to the sun elevation angle, the efficiency of absorption of thermal energy is significant. The average daytime temperature in Oroville in July is 95F . Given a bleached light color of the Zone 3 fill cobbles, gravels, sand, boulders, a comparable energy absorption surface temperature increase would be similar to a concrete surface. Animal researchers, determining safety levels for pets, have tested the thermal rise on different surfaces during the hours of the day . Using this reference table it has a near identical match to the peak day temperature (95F) to Oroville's July peak day "average" temperature (95F) . Using the concrete elevated surface temperature conversion, this would evidence that the Zone 3 surface would be at/near 125F. This is well above the 90F transition temperature that grasses trigger into self preservation "dormancy". If you use the "Grass in the Sun" conversion, the temperature is 105F. Still well above the 90F transition temperature into dormancy. Proof of subsurface water flow beneath the Green Area? 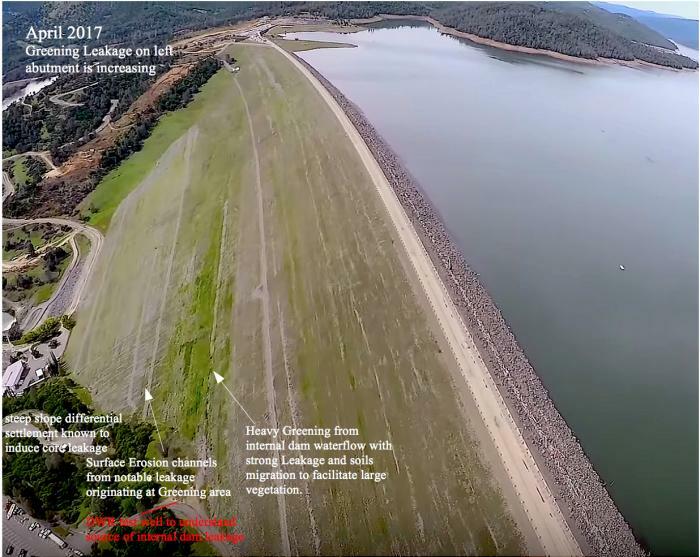 As DSOD has documented that seepage was present in the peak heat season at Oroville and had 81 days of no measurable precipitation prior to this June 20, 2015 inspection, the presence of water at the surface of the Zone 3 Wet Area becomes evidentially significant. How? It is significant given that there is a tremendous evaporative effect that would need to be overcome to maintain some seepage at the Zone 3 surface. Evidence of Proof - with Zone 3 fill surface rock temperatures at or near 125F, what happens to the evaporation rate of any upward or diagonal percolation of subsurface water? When you combine typical arid summer conditions at Oroville, a 3 to 5 mph wind, and 125F surface temperature of the Zone 3 fill, the lbs per hour of water evaporation becomes significant. Depending on slight variations on these variables - such as wind speed - the evaporation rate could remove up to a couple of hundred of gallons per minute for a reference of a measured max 164,648 sq foot Green Wet Area region. In addition, this moisture removal capacity would swiftly influence any grass growth transition into dormancy in the hot periods of summer. Thus, to overcome such a dominant evaporative process - to result in the presence of seepage water in the midst of this "heat" - reveals that there is a deeper flow of cooler water that is able to facilitate a "reach" to the Zone 3 fill surface. The presence of this deeper water flow, combined with the evidence of the formation of the Erosion Channels, dovetails with the process of the downslope substructure intergranular back-cutting erosion within the Zone 3 embankment. Does DWR know the structural integrity of the Dam? If there is an ongoing erosion flow, which the volume of the flow could be "silent" in surface observations, and since DWR's critical internal water pressure sensors (Piezometers) are all broken or non-functional , DSOD/DWR is essentially unable to fully assess & guarantee the internal stability & the slope stability integrity due to this "unseen" and "unmeasurable broken Piezometer" problem . The use of Piezometers are considered absolutely essential in Earth Fill dams  just for this internal stability and slope stability Safety assurance to be able to prove this assurance to the public. What steps could be taken? Although many experts have experience with information and history to such seepage investigations, the most crucial action today is a swift "risk assessment" in conjunction with a "safety action" of lowering the reservoir level - to below the leakage elevation at a minimum. From engineering experience, the following suggested actions may be appropriate considering this situation. These actions include the ruling out or ruling in of a complementary seepage path from the left abutment - however, all of the primary evidence indicates that a "differential settlement" centered investigation should be conducted. See Below. Question: "What should be done about the possibility that the core region is leaking and there is potentially greater threatening subsurface flows within the Zone 3 shell layer? If it is found to be caused by differential settlement in the core region, can it be fixed? Has this been done on other earth fill dams? What is the right course of action from a purely engineering standpoint? (1) I would suggest using use military grade non-invasive spectral Thermal Infrared/Forward Looking Infrared TIR/FLIR camera mounted systems on a suitable aircraft to image map the thermal profile that the subsurface zone 3 layers of hydration leakage creates. I would also suggest using concurrent digital stereo imaging to allow the overlay of the sets of TIR/FLIR captures - at the precise frame by frame moments of the captures. (2) I would suggest contacting the USGS or any group that has obtained InSAR satellite data in the past years and then arrange for an InSAR satellite data capture as soon as available. By doing an Interferometric synthesis of "two" periodic runs, you would be able to get to millimeter precision surface deformations of the entire surface of the Zone 3 embankment of the full dam downstream & crest regions. This data would be very informative of any small anomalies in settlement over the full surface area, including where survey monuments are not emplaced. (3) I would suggest collecting samples of the Green Zone sediment and have a soils analysis performed to identify if there is a standout ratio of any trace marker element component of the clay-clayey borrow pit area near the original pit by Oroville Airport, in addition to any trace element marker element component of the metavolcanic "weathered rock". (4) I would suggest to identify if there were "clear" water flowing at locations in the green area and would capture H2O samples from the most direct flows to have analyzed for any indicative markers. Higher flow points may have better markers from deeper within. (5) For items (3)(4) I would use a portable precision GPS to mark the locations of sediment and H20 sample collection(s) and combine all of the collected data in an overlay map (1) through (5), and have the data computer 3D spatially merged with (1) through (5). (6) I would suggest re-investigating the Grout Curtain Gallery Weir & collect sediment that has been present there and have it cross analyzed to any of the data to see if there are any trace minerals associated with (4)(5). (7) I would carefully inspect the Erosion Channels for sign of intergranular migration in a possible capillary type of voiding percolation flow effect in the surface and in the subsurface of the Zone 3 embankment. (8) I would obtain access to a group of about 3 seasoned experts who are in this unique field that would be chosen for qualities specific to this skillset. Also I would suggest access to construction experts who have experience in doing actual investigations and repairs of this specific situation. (i.e. always leverage the decade levels of expertise + it is the equivalent of a force multiplier, but chosen carefully to their experiences and qualifications). (9) After (1) thru (8), the data should give a good indicator to the magnitude of the hydration of the zone 3 fill, the extent, and possibly "mineral markers" to where the water source is from. There should be distinct mineral markers from the metavolcanic rock if the water source were flowing from or "porting" through the left abutment hillside. If all of the indicators point to an internal dam source path, OR, a strong hillside flow, then I would assess the possible "unknown" or unseeable phreatic percolation that may be deeper within the zone 3 fill. This "worst case" calculation would determine what actions or steps should be taken. (10) Earth Fill dams are fixable over any of these erosion path issues. The challenge for Oroville dam is its volumetric size. If there is belief that there may be a risk of a long term internal erosion flow, determining the exact location/location(s) would be take effort. Differential Settlement (if proven the cause) creates "longitudinal" fracturing. To seal such a potentially wide horizontal type of region, it may be possible with probe injection of a clayey + bentonite mix techniques, however it would require knowing the origin(s) to an accurate degree. (11) Some dams have been compromised in the core to the extent where they were excavated from the crest downward to the level of the defective layering and then they rebuilt the core with a modern clayey + bentonite mix. However, the base of knowledge experience on this process is from smaller earthen dams. Oroville Dam's significant size, with its retention force requirements, seismic requirements, and the combinational "new" core fix materials may require Finite Element Analysis modeling to establish an integrity guideline for a competent and reliable outcome (quantifiable & testable in construction). Fig 1. 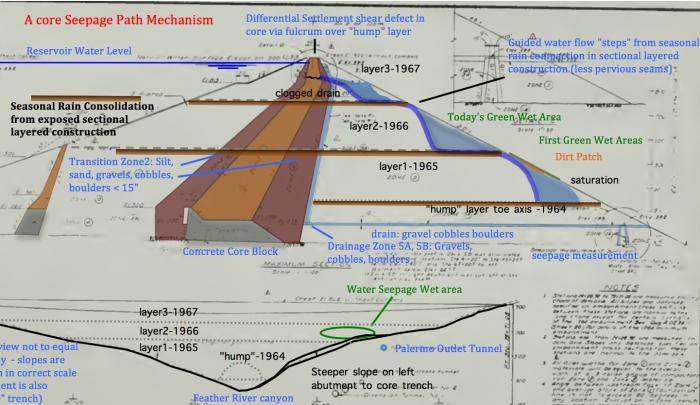 Original leakage behavior of the first "settlement" phases of the dam, caused "twin columns" of strong seepage which deposited thick soil patches from internal "clogging" & dam soils migration. Soils were concentrated forming two "patches". The same process continues today at the Green Wet Area (i.e. "clogging" flow formed a water flow "shelf" to reach the outer Zone 3 shell dam surface at the Green Wet Area). Fig 2. Heavy Greening and Leakage in 2017 from internal "differential settlement" defects allowing lake flow to migrate through core. Unknown total flow rate and extent of internal uncertainties to the bottom "honeycombed" subsurface structure "erosion channels" infers a Zone 3 affected stability "unknown". Soils are "transported" to the Green Wet area contained within the seepage flow "through" the silts, clays, clayey soils of the core region of the dam & extended outward over time just as this same mechanism "clogged" the drain zone with these soils. Fig 3. Original leakage behavior of the first "settlement" phases of the dam, caused "twin columns" of strong seepage which deposited thick soil patches from internal dam soils migration. Migrating Core materials would facilitate soils "benching" flow in the Zone 3 internal layer in addition to assisted "guiding" from original construction layer seams. California Division of Safety of Dams (DSOD) inspection report - DSOD 7/20/2015 - "Seepage in this area was relatively low due to the on-going drought and low water head in the reservoir" - grass brown at date of inspection. "How does the water district monitor its dams to ensure they are safe? - The water district monitors its dams visually and with instruments installed in the dams. In 2005, the water district created a formal dam safety program, which includes dam surveillance and monitoring. The water district uses a number of instruments to monitor its dams. Internal piezometers measure the dam's internal core for water pressure, much like a person monitors their blood pressure. Pore pressures determine how the water is flowing through the dam. This is supplemented with seepage monitoring downstream of the dams. Inclinometers measure deformation, or a change of shape within the dam. The water district also uses survey monuments to check on the movement of dams on the surface. In addition, water district staff, the California Division of Safety of Dams and Federal Energy Regulatory Commission conduct annual inspections of the dams." DSOD Safety Inspection report Feb 8, 2011 Photo 5. "The Piezometer tubing bundle in the S-Block continues to seep."... "A seepage collector pan is visible in the lower foreground". DSOD Safety Inspection report Sep 27, 2016 page 4. "An incomplete FERC Part 12/DSRB recommendation states that "...a plan for long-term monitoring of the phreatic surface within the dam embankment needs to be developed and implemented." "O&M is working with DSOD to develop a course of action"